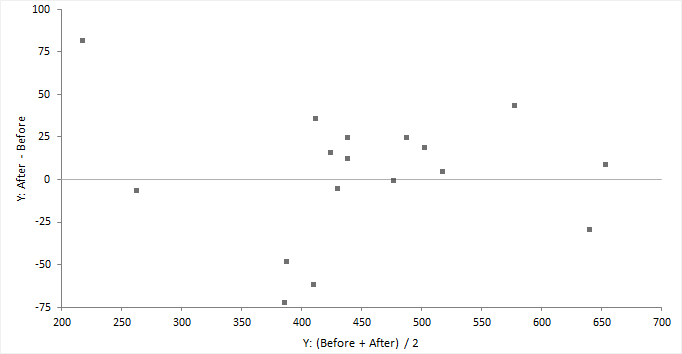 The difference plot shows the difference between two observations on the vertical axis against the average of the two observations on the horizontal axis. A gray identity line represents equality; no difference. If the second observation is always greater than the first the points lie above the line of equality, or vice-versa. If differences are not related to the magnitude the points will form a horizontal band. If the points form an increasing, decreasing, or non-constant width band, then the variance is not constant. It is common to combine the difference plot with a histogram and a normality plot of the differences to check if the differences are normally distributed, which is an assumption of some statistical tests and estimators.